There are few things more enjoyable to a book lover (okay, I admit it…book addict) than to be in a room full of books and authors, where even the booksellers are usually pleasant. While this transplanted Yankee to the deep south often feels like a fish out of water, this is one place in South Carolina where I KNOW I belong! I also admit that I’m a cheap reader on the prowl for bargain books, not the true book collector willing to pay hundreds for rare finds that are mint condition signed copies. I’m sure that’s a relief to my husband who stayed at home with the animal children so I could escape to get my fix in the literary world for the weekend at the South Carolina Book Festival in Columbia. I spent the afternoon in a sea of hundreds of people all with similar goals that revolve around books and their mysterious creators. My first stop was to be Pat Conroy’s talk but when I arrived the only seat left was on the back row in a room packed with at least five hundred people. I sat there for a few minutes and just before the talk was to start I had a brilliant idea…if this room is FULL then the exhibitors hall (where all the books are for sale!) is probably EMPTY! I had a change of heart and slipped out against the tide of people coming in before I even got a glimpse of the beloved author. Sorry, Pat, I’ll catch you on ETV sometime. It was a good decision because it was possible to navigate the aisles and linger at booths without bumping into folks or diving for the books I wanted. I did find Pat Conroy’s new book (The Water is Wide) which I had on my mental list to buy and several others that seemed to be calling my name. A few were calling others’ names like Pedro and the unborn first grandchild of my youngest child whose name we don’t know for sure yet! That was an exciting feeling thinking of spoiling a grandchild with books! I knew it was meant to be when I opened the page to “F is for Frankie…” from the book My Name Is by Alice Lyne (Frankie is, of course, the father-to-be!). Later, when I got back to the hotel I opened it to “P is for Pedro, my best friend’s name is Pablo, we live in Puerto Rico, and we sell parrots.” (And Pedro is, of course, my husband and grandpa-to-be from Puerto Rico!) I MISS reading to my babies and I can’t wait to read to my grandchildren!!! This get-away comes at a perfect time on the heels of working the nine day arts festival which ended last week and was so exhausting I barely enjoyed Mother’s Day. This feels like a retreat and I plan to savor every minute, including this wonderful hotel room where the book festival treasures await me and hopefully some writing too…I’m working on a story that has been simmering for years! 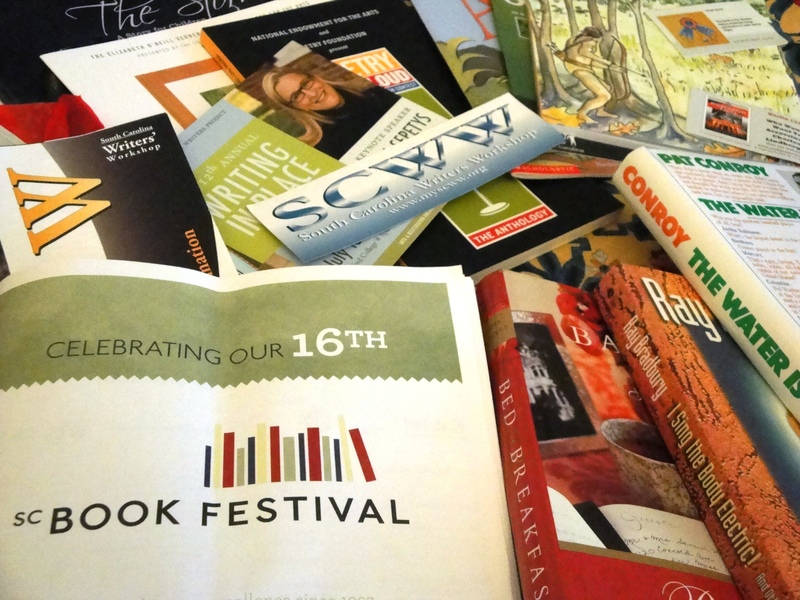 Who knows what tomorrow’s day at the book festival holds? I did enter a drawing for a Kindle…wouldn’t that be an amazing surprise since I have so far avoided buying one? That would be awesome but going against your recent efforts of selling off your books before you move east! Thinking of you at this important and very special time though!